After all the borderline excitement, it was time to get down to the serious business of getting hot, sweaty and tired the day’s walk. I was relieved when the tour bus drove quite considerably up into the hills, as this meant that it had done much of the uphill work and thus I wouldn’t have to. We turned off the coast road at a village called Tučepi, and I was a little surprised to arrive at Gornje Tučepi as the start point. Željko explained that most villages had an upper (older) part and a lower part by the coast, set up as people migrated downwards to serve the tourist industry. “Gornje” means “upper” in Croatian. 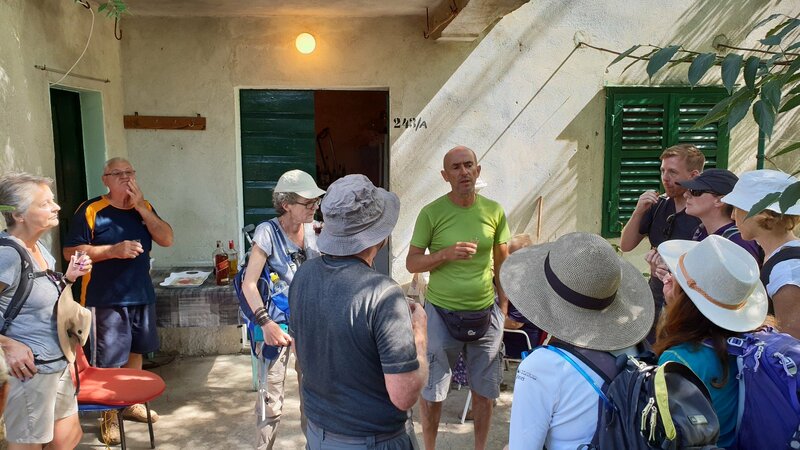 Željko decided that our group needed waking up after a sleepy bus journey, so he took us to visit an older couple he knows who produce wine and spirits from locally-grown produce. So we all had a slug of liqueur to help us on our way. (the husband is the chap standing in the corner watching Željko explaining to us what we could sample – cherry, walnut, prožek or herby grappa. The cherry liqueur was the flavour that was favoured, largely. We also took a peek into the room where the couple produced other things as well – wine, dried fruit and more. And then we were off! The walk went up for a little way (boo!) before starting a long descent. 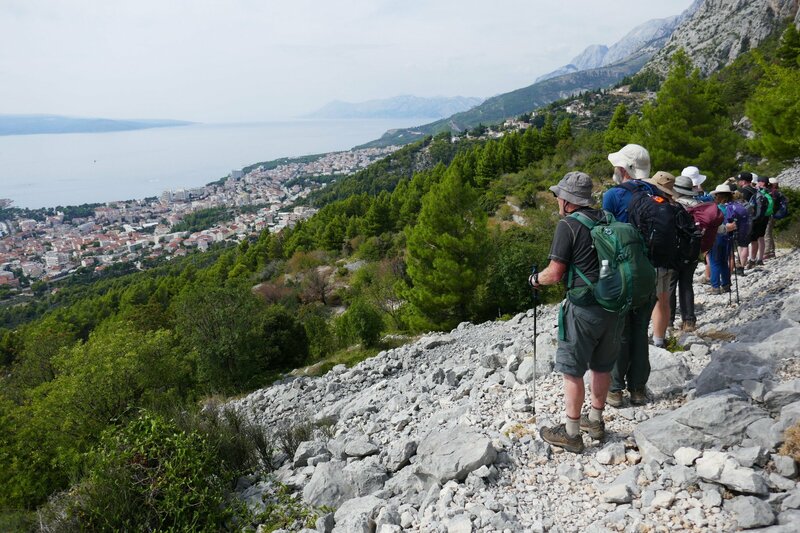 I prefer going down to going up, but I have to say that my knees, ankles and feet were fed up with the downhill by the time we reached our final destination, Makarska. Here’s a video showing the profile of the walk. 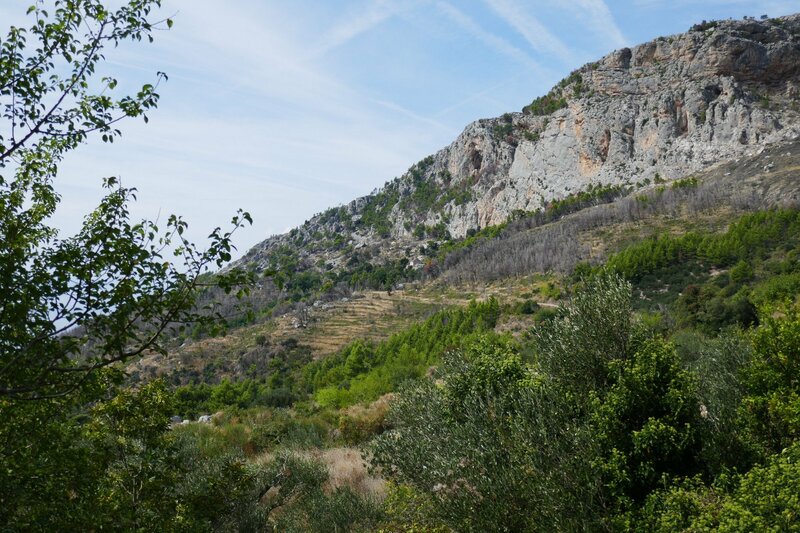 We were in the shadow of Biokovo, the region’s tallest mountain, which stretches for many miles and which towers over the scenery as you walk along. 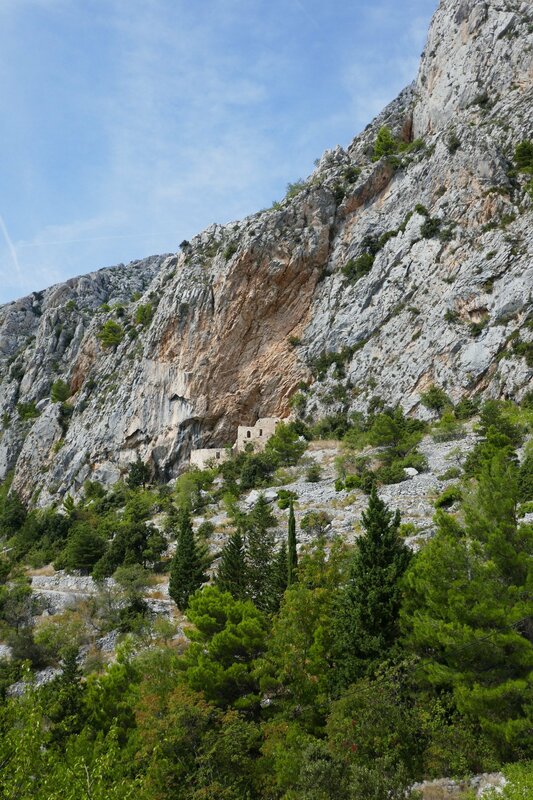 The landscape was largely typical of this area of Croatia – rocky and scrubby, with Aleppo pine as the dominant tree (planted originally by the coast to support tourism, but now aggressively invading up the mountainsides). We eventually reached an area where there had been a major forest fire the previous June. This, in and of itself, was unremarkable, as summer forest fires are common here. But by laying waste to the pines, this one revealed something that many people had forgotten, which is the extent to which the area had historically been farmed using terraces. In this photo, you can see the burnt remains of the pine trees, and also the terracing thus revealed, which went a lot higher than had been prevously recognised. 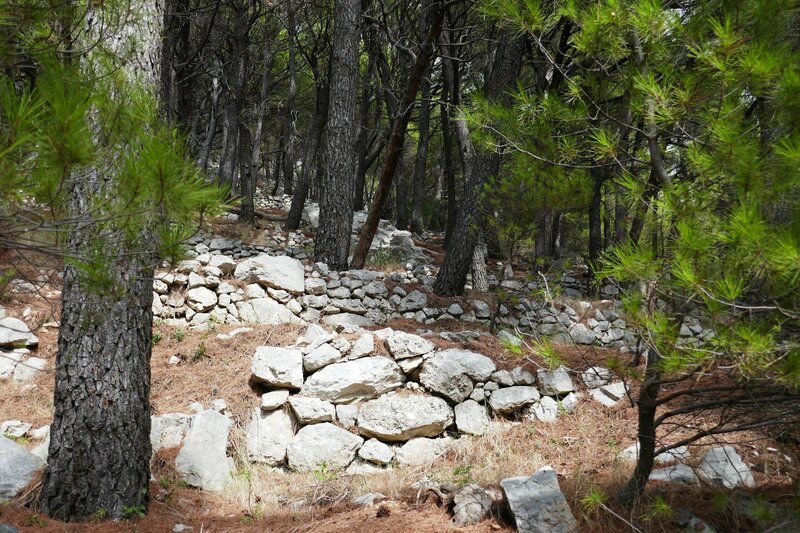 Later on, we passed through an area of terracing showing how the pines had taken over. as well as, one surmises, taking a bit of a breather from scrambling along and down the scree which you can see our path led through. It really was quite hard going, requiring concentration to keep one’s footing as well as taking its toll on knees, ankles and feet. So we stumbled and slid our way down into Makarska, and I have to say that two large beers disappeared really quite swiftly before we had to board a ferry in the rather attractive Makarska harbour. An hour on the ferry took us to the island of Brač, where we would be for the next couple of days. We arrived in Saumartin, which, like so many Croatian places, is very handsome. And then we boarded a couple of taxis to take us to Bol and our hotel for our stay on the Island, the Villa Daniela. As ever, there was good and bad news. The good news is that we had a room with a balcony. The bad news? We had to climb to the third floor (four stories higher than street level, actually) to get to it. 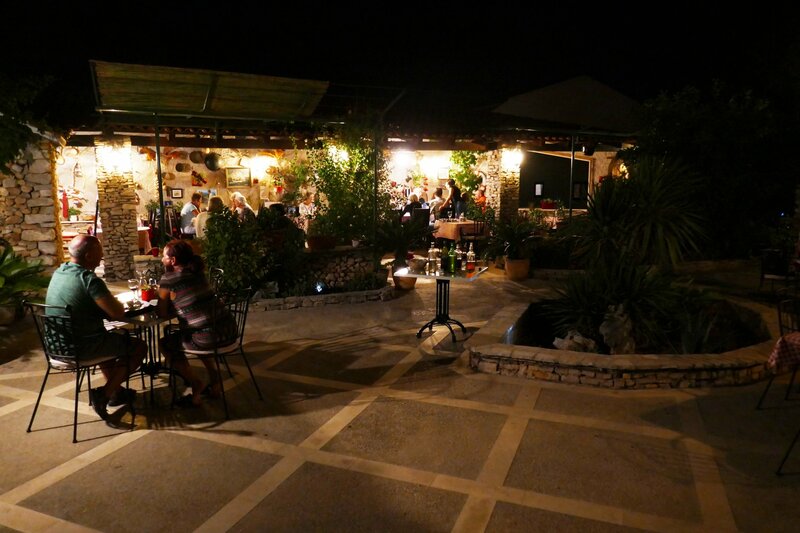 The exertion needed to get us and the suitcases up the narrow stairs to the room justified the swift gin-and-tonic we necked before Željko took us to a very unusual restaurant, one that isn’t in the normal tourist directories. It’s called Kito, and is actually the catering facility attached to a camping site. 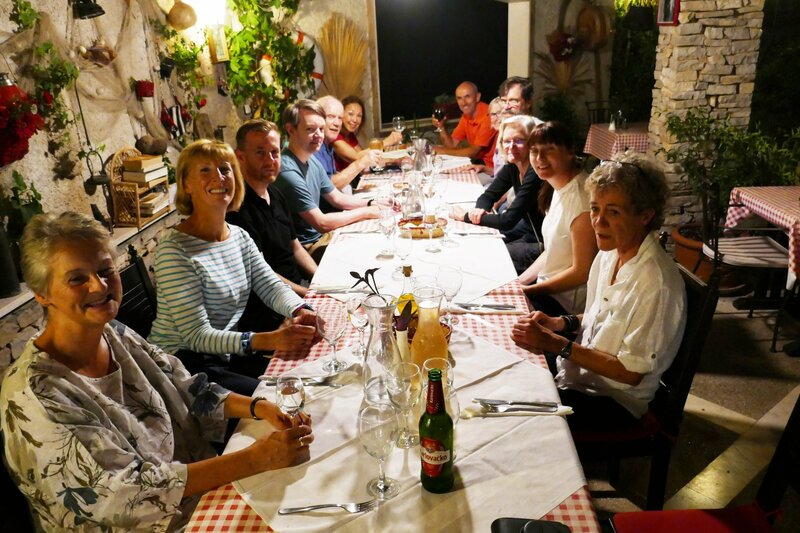 But we benefitted from Željko’s contacts as he was able to get us a table for 13 in order to eat a traditional local meal called “Peka”, a baked, mixed-meat dish prepared under coals in a barbecue. 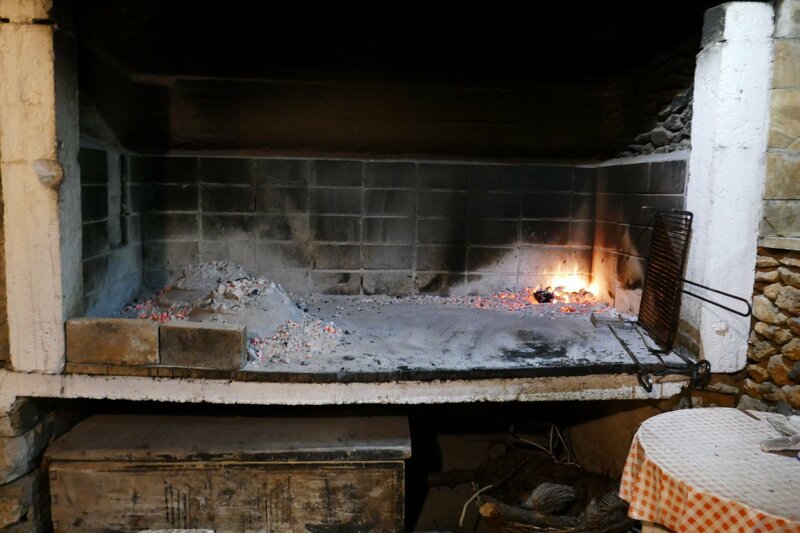 (the peka is being prepared in the cooking pots under the coals on the left). 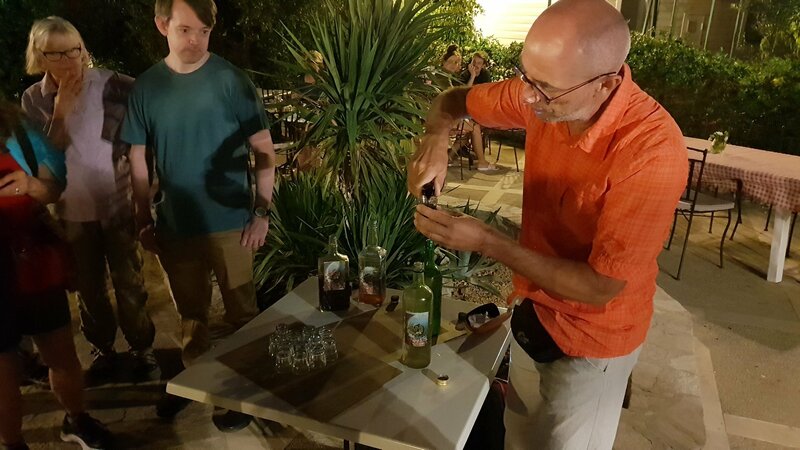 First, of course, we had to try a few more of the local home-made liqueurs, again with Željko as host. and the surroundings there are very nice in the dark of the evening. 2 Responses to "Day 3 (II) – Down, Down"
Seems like a hard day’s walk down all the stone! I’ve always dreamed of Croatia but haven’t been there as of yet, so it’s really fun following in your footsteps.